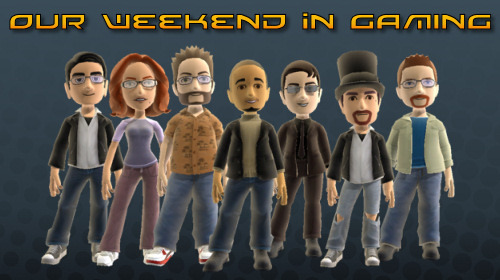 Co-Optimus - News - Our Weekend in Gaming - August is Here! Our Weekend in Gaming - August is Here! Believe it or not it's August already. Time to clean up the back catalog before the fall onslaught begins! Nick "bapenguin" Puleo - "Busy weekend but I hope to get some Company of Heroes: Tales of Valor, Turtles in Time, and Halo in. Who knows what else." Marc "DjinniMan" Allie - "The new Ninja Turtles and R-Type Dimensions for me. Hopefully some Dawn of War 2 also!" Katrina "ShadokatRegn" Pawlowski - "Gaming arcade again: TMNT: Turtles in Time, wrapping up Splosion Man, hopefully finishing up the BDI Madballs campaign, and downloading some Demos that hit Live (Namely: Arkham Asylum!)" Mike "pheriannath" Katsufrakis - "I'm visiting Nick this weekend, so I'll probably spend most of my time wiping drool off of his laptop, but I believe we're going to go slightly retro and play the original Halo in co-op. I'll also be playing some Secret of Monkey Island: Special Edition and Space Invaders: Infinity Gene on my iPhone." Jason "OrigamiPanther" Love - "Tonight I'll be playing some Left 4 Dead Vs with a bunch of folks from Co-Optimus and looking forward to some zombie inspired mayhem. I also picked up Turtles in Time Reshelled earlier this week so I will be looking for some fellow turtle enthusiasts to co-op with over the weekend." Jim "txshurricane" McLaughlin - "I'll be playing some casual games on my new Google G2 phone, and plenty of the COD: World at War Map Pack 3. I'm also looking forward to the Batman: Arkham Asylum demo and a new Lips video from Nick and Mike!" Loren "AgtFox" Halek - "Probably playing Madden 10 through the weekend with the hope I can have a review ready by embargo lift on Monday. May play more Spider-Man: Web of Shadows as well."